Excellent quality, perfect Aquamarine crystal from Namibia, with lovely clarity and colour. Aquamarine is a beautiful blue to sea-green mineral of the Beryl family. It is known as the Stone of Courage, giving the wearer strength, whilst also calming and soothing the spirit. It has a special affinity with sensitive, intuitive people. It is said to both shield the aura and also to align the chakras and sharpens the intuition. This makes it an excellent crystal to hold/wear/use whilst meditating and can also be of great use in a crystal grid. Its keywords are loyalty, friendship, trust, compassion and harmony. The colour variation; from sky blue to sea green with every shade in between, make this a divine stone; balancing sky and sea, heaven and the oceans. 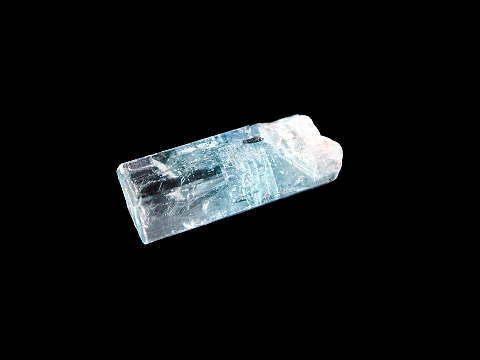 In ancient times Aquamarine was believed to guard against attack from the dark side and black magik. It has an energetic link with Atlantis and legend has it that it originated from mermaids' treasure chests, along with pearls, making it a lucky, favoured stone of sailors. It's said that when offered in an engagement ring or as an engagement present, it augurs a happy, joyful and abundant marriage.